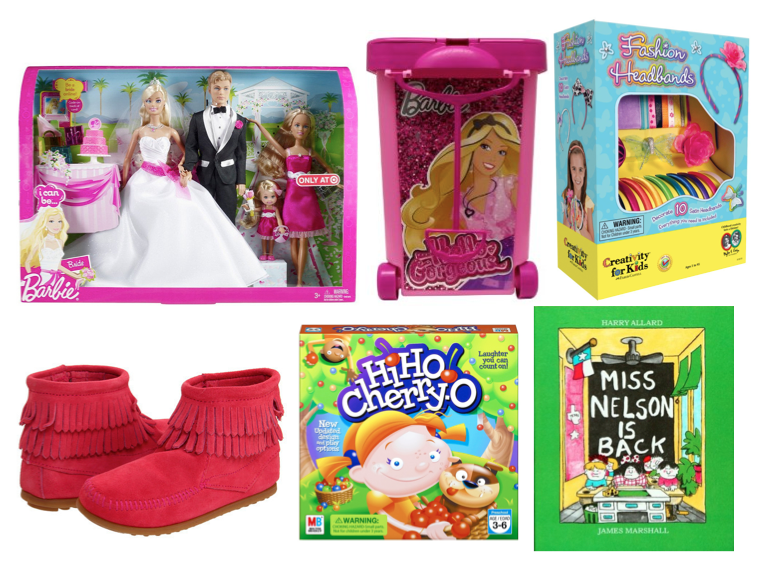 Here are some of the things that my 4 1/2 year old wants for the holidays. Believe me, her list is much longer!… So I had to choose only a handful for this list. 1. Barbie Bridal Doll Set. She loves everything Barbie. She probably wants every Barbie play set available. She loves to change the outfits, play with the hair, and pretend play with the various dolls, accessories and furniture. If it’s Barbie anything, she’ll love it. I know she especially wants this set, as she is also very into weddings. Probably as a result of watching too many Disney movies! Yes, Cinderella and Ariel, I’m talking to you. 2. Barbie Store It All. She already has a lot of Barbie dolls, Barbie clothes, Barbie shoes, Barbie accessories, etc. This Barbie storage case is the perfect thing to stash all of the dolls in. The top has compartments for the clothes and accessories. And it is on wheels! She can wheel her Barbies from room to room. Plus, cleanup will be a cinch – Just toss everything in. So I guess it will make my life easier, as well – Love that! 3. Fashion Headband Craft Set. Accessories are very important to this little 4-year-old. She also loves crafts, especially when she can create something that she can actually use. This make your own headband set is the perfect combination of fashion and fun. Plus, I love things that let her use her creativity. 4. Minnetonka Double Fringe Boot. Hailey loves fashion and dressing up. After all, she says she wants to be a Fashion Designer when she grows up. Since it’s the season for boots, these are a really cute option. Plus, they’re pink! They have a zipper on the side for easy on/off. They will look adorable with leggings or a dress. She loves wearing boots, and this is a stylish version to add to her wardrobe. 5. Hi Ho Cherry-O Game. She loves to play games. And I love playing games with her because I get to have fun with her, and because playing games allows her use her mind. She thought this one looked like fun. And, it’s just right for her age group. 6. Miss Nelson Is Back. Hailey loves to read almost more than anything else. By read, I mean either have a story read to her, or simply to look at the pages by herself. She goes to sleep with stacks of books in her bed, and she carries a book with her almost always. She just loves books… And I like to encourage this. She has Miss Nelson Is Missing, and loves it. This is another book in the Miss Nelson series.